When it comes to the Voter Suppression Hall of Shame, Kris Kobach is an all-star. 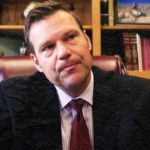 As Kansas’ Secretary of State, Kobach has pushed voting restrictions like strict photo ID, proof of citizenship requirements and voter purges. If there’s an unfair, unnecessary, anti-democratic voter suppression tactic out there, Kris Kobach has probably tried to force it onto the voters of Kansas. And the nation: In 2017, Kobach served as vice chair of the Presidential Advisory Commission on Election Integrity or, as we like to call it, the voter suppression commission to re-elect the President. Still, despite this anti-democratic record and these repeated failures, Kobach is running this year to be Governor of Kansas.